you can use a 7-pin MIDI cable between the Patch Panel and the AXE-FX and use the AXE FX Phantom Power Jack to send power to the MFC MIDI Foot-controller. 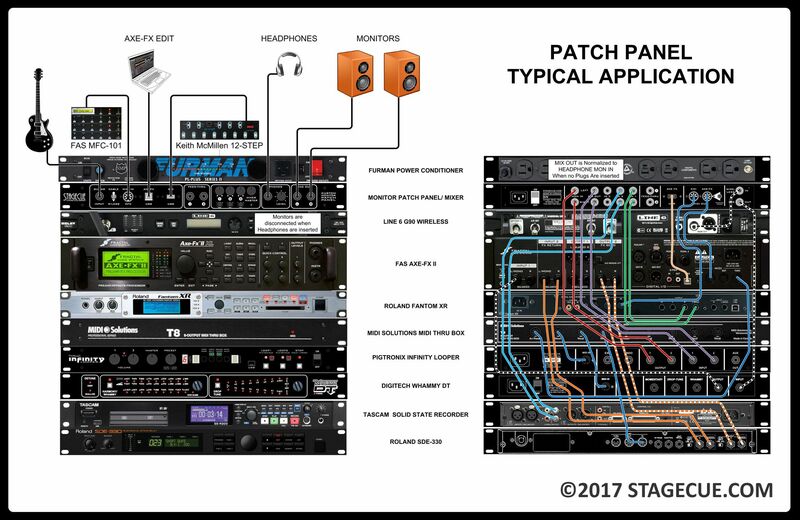 This Patch Panel's Phantom Power IN Jack allows redundancy for powering the MFC in case the 7-pin MIDI cable between the Patch Panel and the AXE-FX is damaged... you can use a standard 5-pin MIDI cable in an emergency. The front and rear panels were designed in CorelDraw© and laser-engraved by AD Engraving in Toronto. The panels were drilled manually and stuffed with all of the 1/4" jacks MIDI jacks and control pots.